Does White Bread Make You Fat? While one piece of white bread probably won't go straight to your hips, eating too much may lead to weight gain. What's more, research shows that choosing refined grains such as white bread, rice and pasta could make you more likely to pack on unwanted fat than eating whole grains such as whole-wheat bread or pasta or brown rice. While it's not necessarily true that bread makes you fat, white bread in particular can make you gain undesirable fat — also called visceral fat — which may be dangerous. Whether you eat white bread or not, you only gain weight by consuming more calories than your body needs for energy. Faced with a calorie surplus, your body stores the excess as fat. The weight-gain process typically occurs gradually, as it takes a 3,500-calorie surplus to gain just 1 pound. The average slice of white bread contains just 75 calories, so you'd need to eat a lot of bread to cause rapid weight gain. In other words, it's not the foods that make you fat, it's the amount. 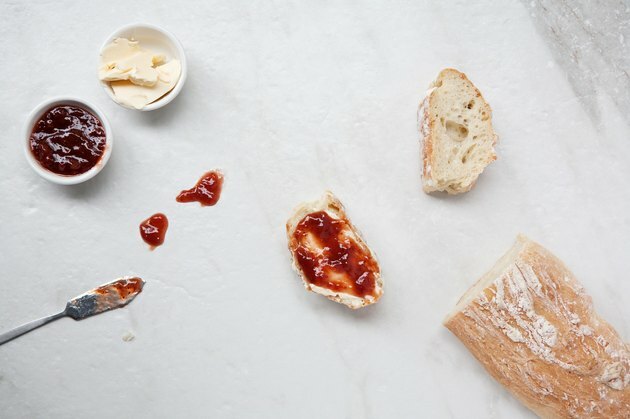 Read More: Have We Been Wrong About White Bread This Whole Time? While white bread may not be especially high in calories, it may contribute to weight gain by spurring cravings, causing you to consume more calories throughout the day. Refined grains are stripped of the fiber-rich bran and germ, leaving only the starchy endosperm. That's why white bread has less nutritional value, and less fiber, than whole wheat alternatives. Your body absorbs starchy foods relatively quickly, leading to a rapid rise in blood sugar. Blood-sugar levels soon crash, causing cravings — often for more refined carbohydrates, perpetuating the cycle. Fiber also slows food in the digestive tract, helping you feel fuller longer. Without the fiber, white bread is emptied quickly from your stomach, further increasing hunger and promoting weight gain. Food may influence how your body distributes weight, and refined grains such as white bread make you store fat in the abdominal region, expanding your waistline. It can also make you gain visceral fat which can be dangerous for your health. In 2015, a study was published in the British Journal of Nutrition showed that looked at people following Mediterranean diet. The participants were split into two groups. One group lowered their whole grain bread consumption and the other group lowered their white bread consumption. The group that ate less white bread in their diet lost weight, in particular belly fat. An article from Harvard Health Publications warns that visceral fat, which is stored deep in your abdominal cavity and covers your organs, puts you at risk for cardiovascular disease, diabetes and breast cancer. A 2018 study published in the Plant Foods for Human Nutrition looked at whole grain versus white bread consumption in Japanese subjects. They found that people who ate white bread were at greater risk for developing potentially dangerous visceral fat. If you do choose to eat white bread, help ensure proper nutrition by consuming moderate portions as part of a balanced diet. Following the U.S. Department of Agriculture's MyPlate guidelines, a 2,000-calorie diet should include just 6 ounces of grains per day, with each slice of bread or half-cup of cooked rice or pasta counting as 1 ounce. At least half of those grains should come from whole-grain sources, leaving room for no more than 3 ounces per day of refined grains such as white bread. Non-grain food groups to fill out the rest of your diet include fruits, vegetables, dairy and protein-rich foods such as beans and fish. Cabrillo College: Want More Energy and to Shed a Few Pounds? Go with the Whole Grain! ChooseMyPlate.gov: What's on Your Plate? Plant Foods for Human Nutrition: Effects of Whole Grain Wheat Bread on Visceral Fat Obesity in Japanese Subjects: A Randomized Double-Blind Study. Have We Been Wrong About White Bread This Whole Time? Does White Bread Have Fiber?